Workers in Arkansas, currently receive $8.50 hour as their minimum wage. That will increase to $9.25 on January 1, 2019; $10 on January 1, 2020; and to $11 hour by 2021. Those figures amount to $455 million more in pay for Arkansas workers by 2021—an average of $1,520 each. This will result in a quarter of the state’s workers getting a raise. In Missouri, where the state’s $7.85 hour minimum wage is just above the federal minimum wage of $7.25, pay would reach $12 an hour by 2023—and more than $1 billion for Missourians by 2023, a total of roughly $1,485 per worker. This will result in more than 675,000 workers getting a raise. These states will soon have some of the highest minimum wages. 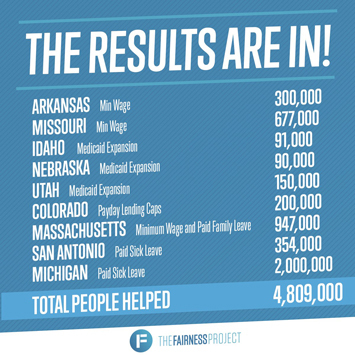 The Fairness Project, an advocacy group coordinating minimum wage campaigns around the country, said it was confident both ballot measures would pass, despite Missouri and Arkansas being Republican-leaning states. Support for higher minimum wages often crosses party lines, and such proposals have fared very well when put directly to voters in recent years. “When it comes to the minimum wage, the biggest gap isn’t between Republicans and Democrats; it’s between politicians who don’t want to raise the wage and the people they represent,” said Jonathan Schleifer, executive director of the Fairness Project, in an email to CBS MoneyWatch. The Fairness Project is an advocacy group that supported the measures. Arkansas Governor Asa Hutchinson, a Republican, was against the ballot and called it a “job killer.” He told voters to reject the pay hike and let the GOP-controlled legislature to decide the matter. The governor and many business leaders were concerned the state would lose jobs and businesses to other nearby states since nearly all of the surrounding states pay the federal minimum wage of $7.25, which has not budged in nearly a decade. While the voters in Arkansas and Missouri are celebrating, the legislature may still be able to overturn the voters wishes. That’s what happened in Washington, D.C., when voters passed the ballot to raise the minimum wage to one wage for all workers. Initiative 77 was approved by city voters in June to raise the minimum wage for tipped workers, such as waiters and bartenders, incrementally until their minimum wage matched that of other workers in the city by 2020. Even though the voters sanctioned it, the D.C. City Council overruled it. “If the law is a bad law, it should be amended or repealed. It does not matter if the law was adopted by the council, the voters or Congress,” said Chairman Phil Mendelson (D), who led the repeal charge. Advisory Neighborhood Commissioner Anthony Muhammad agreed and told The Final Call: “The peoples’ vote would have destroyed small businesses because of the higher wages they would be forced to pay employees. On the heels of the success of the measures in Missouri and Arkansas, Louisiana Governor Jon Bel Edwards said it was time for his state to consider a similar move.